Highway 407 station, er, design, as approved by the TTC this week. 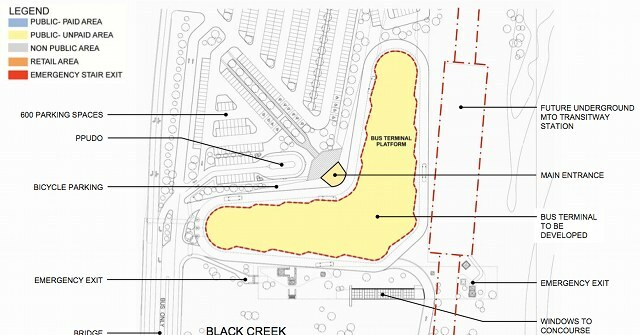 “Due to ongoing negotiations with stakeholders,” says the design approval document, “surface facilities are not at the same level of development as the below ground structures.” All we know is that there will be a parking lot and an entrance, which is sort of obvious, and a GO Transit and York Regional Transit bus terminal somewhere in that big L-shaped gap. No reason’s been given for the failure of imagination: just a note that “the concept is still under development with input from GO and YRT,” along with a promise that the final site will be presented at a public open house in a few months’ time. The designer for the station on the toll highway will be Aedas, who did the pleasingly aerodynamic design for Sheppard West, so we might expect something similar, but who knows. Still, this could be the perfect opportunity to sling some ideas the TTC’s way. Torontoist thinks the aerial projection of the site plan (above) looks a bit like a huge moth; at a push it could be made into some kind of Batman symbol, perhaps to be projected into the sky to call for help should somebody carelessly dig into a tunnel. Not that this would ever happen, of course. If the private consortium that runs the highway could be persuaded to part with some of the eight-million-dollar profit they made last quarter, cost would be no object. So, what would you put inside the dotted line? Renderings courtesy of the TTC.